Ken practices at Adobe Animal Hospital as an ICU and Blood Bank Manager. He is an active educator, lecturing internationally, providing practical instruction, and authoring texts, chapters, and articles on transfusion medicine, respiratory care, and critical care nursing. He serves on the boards of the Veterinary Emergency and Critical Care Society and the Academy of Veterinary Emergency and Critical Care Technicians, on the Veterinary Innovation Council, and as the NAVTA State Representative Chairperson. He is a graduate student in veterinary medicine and surgery through the University of Missouri. 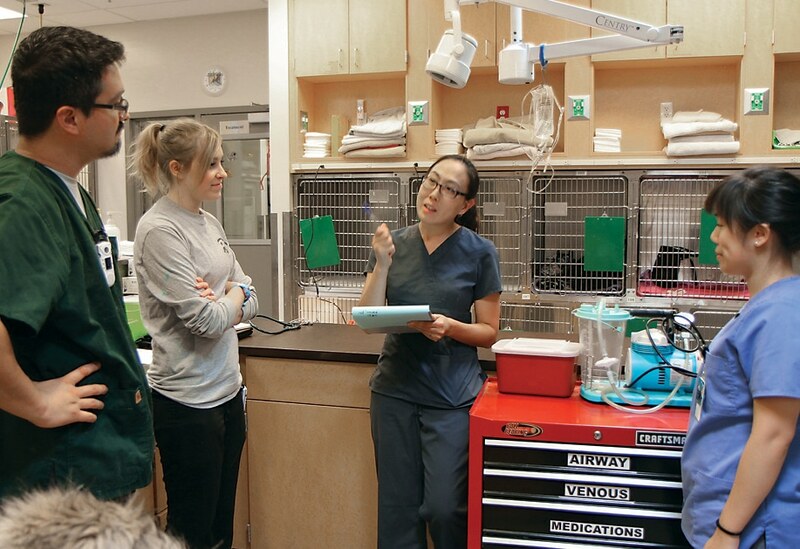 Ken invites all veterinary technicians to ask “Why?” to understand the “What” and “How” of our field and to constantly pursue new goals as veterinary professionals. Reviewing the video footage of this incident, we can critique the way CPR was performed and discuss its potential effectiveness in light of evidence-based CPR guidelines established in 2012 by the Reassessment Campaign on Veterinary Resuscitation (RECOVER) Initiative. The RECOVER guidelines were produced through a series of systematic reviews conducted by more than 100 specialists in the field of emergency and critical care and allied specialties. 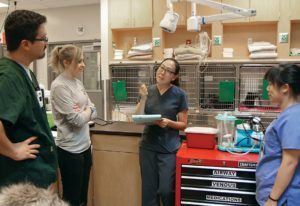 The RECOVER initiative also identified a series of knowledge gaps toward which the veterinary community can direct its investigative efforts to continue to improve the effectiveness of CPR. 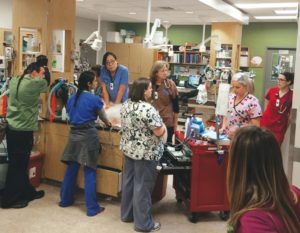 The guidelines are accessible at no cost (veccs.org/recover-cpr), and veterinary professionals can use them to develop CPR training standards for veterinary teams today. The guidelines address 5 aspects surrounding cardiopulmonary arrest (CPA): preparedness and prevention, basic life support (BLS), advanced life support (ALS), monitoring, and post–cardiac arrest care. With the documented rate of successful resuscitation by CPR and survival to discharge being approximately 6%,2 the veterinary team must be prepared for CPA to maximize chances of resuscitation. Preparedness begins with obtaining the knowledge behind CPR as well as psychomotor (physical) training for performing it. Initial training should introduce all key concepts of CPR; refresher training is recommended at least every 6 months to keep the knowledge current and reinforced. FIGURE 1. A properly organized and equipped crash cart located in a central emergency area is critical for swift intervention. A designated emergency area should be centrally located and fully stocked for performing CPR. 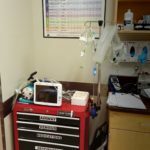 The staff should be familiar with an organized crash cart containing necessary supplies, drugs, equipment, and documents, and the cart should be routinely checked (either on a schedule or a per-use basis) to ensure it is properly stocked and that everything is in-date and functional (FIGURE 1). Crucial items include equipment for securing the airway and venous access, emergency medications, monitoring equipment, and other supplies to facilitate CPR and emergency surgical procedures (BOX 1). 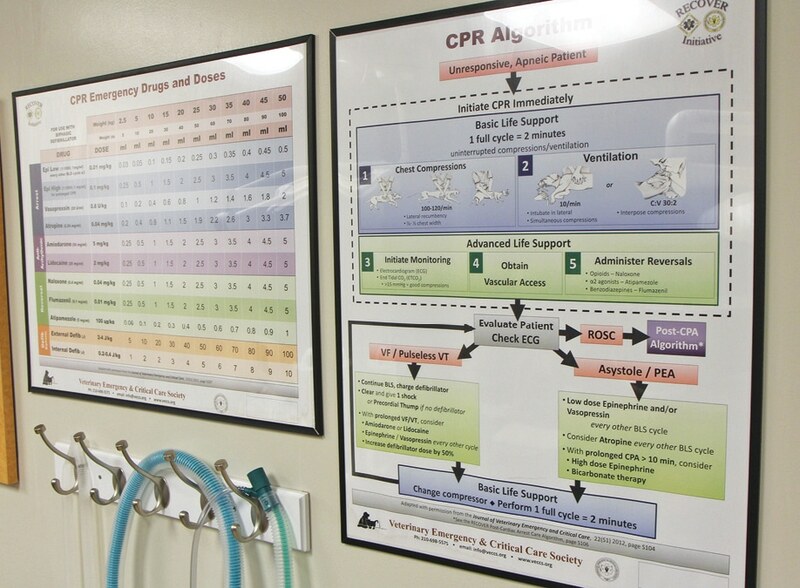 The emergency area should also contain visual aids, such as the CPR algorithm and CPR drug dosage chart (available from veccs.org), which will improve efficiency during the event3 (FIGURE 2). FIGURE 2. 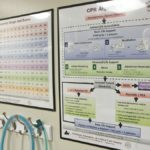 Large cognitive aids posted in the emergency area can improve the efficiency of and consistent adherence to guidelines by the CPR team. 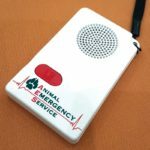 Every animal admitted to the practice should have a designated resuscitation order established via a thorough conversation between the veterinary team and the owner to prevent delays in implementing CPR if needed. Color-coding housing labels, patient charts, or patient tags to indicate the patient’s resuscitation order can reduce confusion. Patients with a chronic disease that has progressed to the point of causing CPA are less likely to respond to CPR. CPA as a consequence of an acute condition is more likely to have a successful outcome. Otherwise healthy patients that arrest because of an anesthetic event have a much higher chance of survival, reported to be 47% in one study.2 Every effort should be made to ensure the resuscitation order is appropriate for the patient by accurately assessing its chances of survival. FIGURE 3. (A) For round-chested dogs (chest as wide as it is deep), compressions are focused on the widest point of the chest. (B) For narrow-chested dogs (chest deeper than it is wide), compressions are focused over the heart. (C) Some dogs might be considered to be flat-chested by typical breed conformation, but each individual should have its conformation assessed for the optimal compression point. This dog would benefit from compressions on the widest point of the chest in lateral recumbency. If the patient is truly wider than it is deep, then compression over the sternum (red arrow) is reasonable. Chest compressions are recommended to be performed at a rate of 100 to 120/min regardless of species and size and forceful enough to compress the chest one-third to one-half of normal width. Compressions should be performed in 2-minute cycles without interruption; this is because 60 seconds of consistent compression is required for myocardial perfusion pressure (MPP) to reach its maximum potential, and every second of interruption leads to significant decreases. 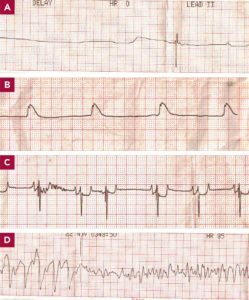 Thus, any patient assessment (eg, electrocardiography [ECG], pulse palpation, auscultation) should be limited to several seconds between the 2-minute cycles to prevent complete loss of accumulated MPP. Two minutes of uninterrupted chest compressions is physically taxing, and switching the compression provider for each cycle is recommended. Physical aspects of chest compressions include the provider superimposing his or her palms (ie, stacking the hands flat, with the palm of one on the back of the other) and creating downward motion onto the patient through a “compression point” (as opposed to an “area”). 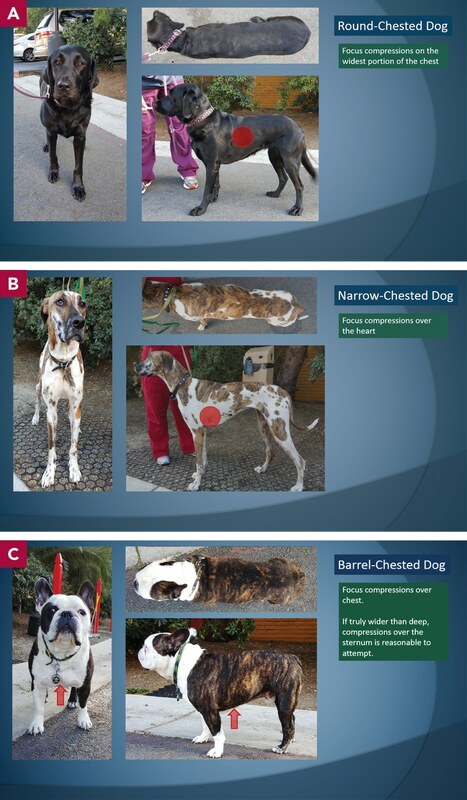 The compression point depends on the conformation and size of the patient, which should be evaluated individually, even though breeds are associated with each type (FIGURE 3). Round-chested dogs (chest as wide as it is deep) benefit from compressions focused on the widest part of the chest cavity with the patient in lateral recumbency, with the goal of creating intrathoracic pressure and thus using the thoracic pump theory. In this model, the increased intrathoracic pressure applied to the vasculature within the thoracic cavity creates forward blood flow. Release of pressure allows the rib cage to recoil open, creating negative pressure to pull blood from the abdomen into the thoracic cavity, which is then pushed forward again with the subsequent compression. In dogs with a narrow or keeled chest (deeper than it is wide), the cardiac pump theory is applied by focusing compressions over the heart while the patient is in lateral recumbency. Each compression physically pushes blood out of the heart, while each recoil allows blood to flow in. For flat-chested dogs (ie, the chest is truly wider than it is deep), compressions should be focused over the sternum with the dog in dorsal recumbency, to employ the cardiac pump theory. FIGURE 5. Positioning for chest compressions. (A) Forward view demonstrating superimposed palms and locked elbows. (B) Side view demonstrating the shoulders positioned directly over the patient in a perpendicular manner. FIGURE 4. Small dogs and cats can have compressions focused over the heart with one hand. 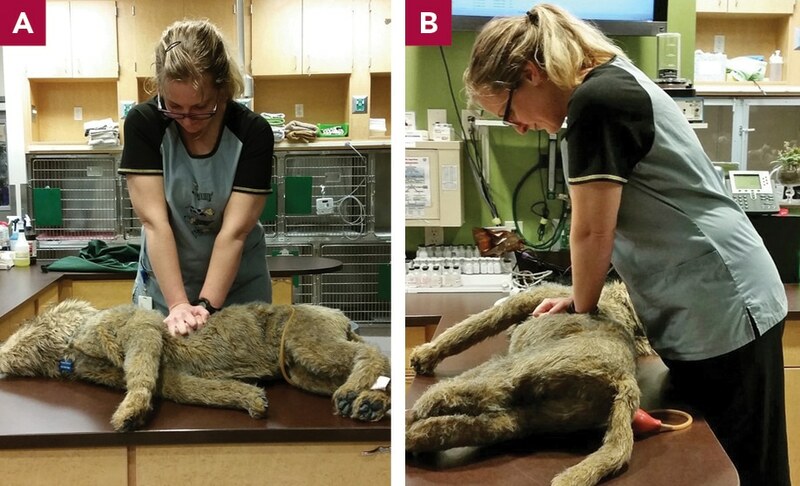 In small dogs and cats, compressions can be performed directly over the heart while in lateral recumbency, using a single- or two-handed method (FIGURE 4). Key aspects of the physical positioning of the compression provider include (1) superimposed palms, (2) locked elbows, and (3) standing at a sufficient height to place the shoulders directly above the patient. This height can be achieved by standing on a step stool or by kneeling safely on the same surface as the patient (whether it be the table or the floor). The downward force should be created by the core muscles of the abdomen rather than the arms, allowing stronger exertion of force and longer sustainability (FIGURE 5). FIGURE 6. 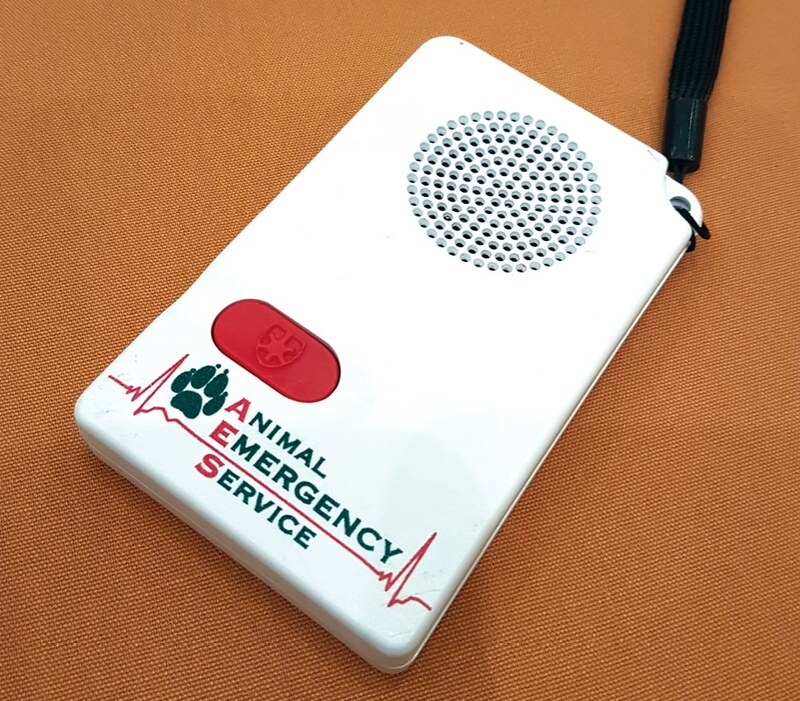 An auditory timing aid device for veterinary CPR. The use of such aids as a metronome can help maintain specified compression rates; training to perform compressions to familiar songs of the appropriate beat can be helpful as well (BOX 2). 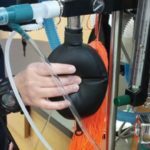 More recently, devices designed to provide audio cues for timing compressions, ventilations, and 2-minute cycles have become available (FIGURE 6). Ventilation should be started as soon as possible once compression is initiated. Endotracheal intubation is performed with the patient in lateral recumbency without interruption of compressions, and the cuff is inflated so that PPV is directed into the lungs instead of into the stomach or out the mouth. 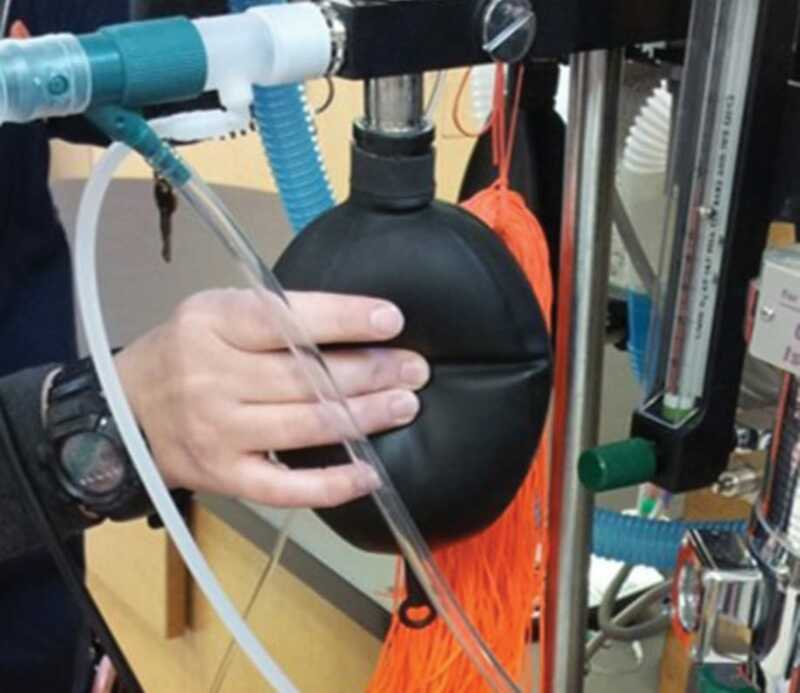 Breaths are provided 10/minute at a tidal volume of 10 mL/kg over a 1-second inspiration time through the reservoir bag of an anesthetic machine or a manual resuscitator (FIGURE 7). If a spirometer is not available, a manometer reading of 20 cm H2O indicates consistent breaths. The reduced respiratory rate of 10 breaths/minute and subsequently low per-minute ventilation (approximately 100 mL/kg/min versus the normal 200 mL/kg/min) are tolerable because of the reduced pulmonary blood flow during arrest. Keeping the breath size and frequency consistent also helps prevent eliminating too much carbon dioxide and thereby causing hypocapnia through hyperventilation, which would cause cerebral vasoconstriction and impair blood flow to the brain. FIGURE 7. 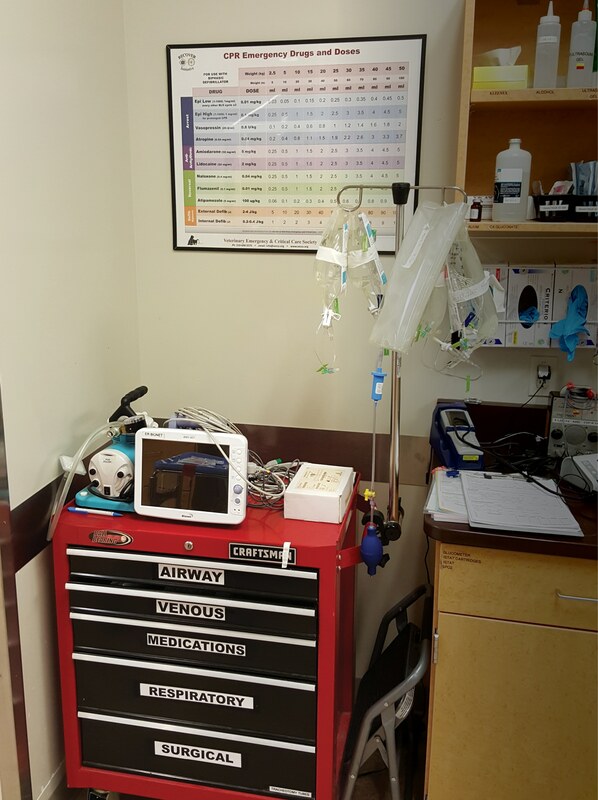 Positive-pressure ventilation can be performed with a reservoir bag on the anesthetic machine. If endotracheal tubes are unavailable, mouth-to-snout ventilation can be used, although its efficacy in providing adequate ventilation and oxygenation is currently unknown.4 Mouth-to-snout ventilation is performed by closing the animal’s mouth and keeping the neck in alignment with the spine while the rescuer blows through his/her mouth into the nares of the patient. FIGURE 8. An intraosseous catheter driver can facilitate venous access in emergency cases. The photo demonstrates tibial placement with an electric intraosseous driver. The femur and humerus may be used for manual placement as needed and able. A variety of drugs are used during CPR to maximize chances of ROSC. Administration through the IV or intraosseous (IO) route is appropriate. While venous access might already be established in hospitalized animals, swift establishment of venous access is necessary for patients brought into the emergency room in CPA. Procedures such as venous cutdown or IO catheter placement can minimize the time required to establish venous access but should not interrupt BLS interventions. In larger patients arriving in arrest, the use of an IO drill stored in a designated location can reduce the time required to establish venous access to 30 to 60 seconds (FIGURE 8). Drugs used in CPR include vasopressors, parasympatholytics, reversal agents, antiarrhythmics, IV fluids, and alkalinizing agents (TABLE 1). IO, intraosseous; IT, intratracheal; IV, intravenous; VF, ventricular fibrillation; VT, ventricular tachycardia. Epinephrine is the most commonly used vasopressor during CPR, serving to cause vasoconstriction through its action on the α1, β1, and β2 receptors to redirect the blood flow from the periphery to the body core and vital organs.5 Two epinephrine dosages are specified by the RECOVER guidelines. The low dose (0.01 mg/kg IV or IO) is associated with a higher rate of survival to discharge, while the high dose (0.1 mg/kg IV or IO) is associated with a higher rate of ROSC. Note that although the high dose may be more likely to induce ROSC, the chance of survival to discharge is lower, possibly related to reduced perfusion to vital organs due to severe vasoconstriction.7 Epinephrine is dosed once every 3 to 5 minutes, making every other compression cycle an ideal time for administration. Epinephrine can be administered via the intratracheal route at twice the IV/IO dose; a long catheter is used to administer the drug diluted 1:1 with saline or sterile water into the lower airway through the endotracheal tube5; however, this route should be used only when venous access is not possible as the effect of the drugs remaining in the airway upon ROSC is difficult to predict. Vasopressin, which acts on vascular smooth muscles through the V1 receptor to cause vasoconstriction, can be used in lieu of or in conjunction with epinephrine for the same effects. No additional harm caused by the use of vasopressin over epinephrine has been observed, and there might be potential benefits such as responsiveness in acidic environments and a lack of inotropic and chronotropic effects that can add to myocardial ischemia when ROSC is achieved.5,7 The suggested dosage for vasopressin is 0.8 U/kg IV or IO, and it can be administered intratracheally as described for epinephrine. Atropine is a parasympatholytic commonly used in CPR at 0.04 mg/kg IV or IO every other compression cycle. While there are no high-quality studies showing clear benefits of its use in CPR, there is no evidence of harm. Atropine is thought to be beneficial in patients with asystole or PEA, especially those suspected to be experiencing high vagal tone (eg, vomiting, ileus, gastrointestinal disease, respiratory disease).5,7 Intratracheal administration is also possible at 0.08 mg/kg. If patients in CPA were under the influence of any reversible anesthetic agent or sedation, reversal of said agent could improve the chances of successful outcome. Atipamezole, flumazenil, and naloxone are readily available reversal agents for α2 agonists, benzodiazepines, and opioids, respectively. If the patient is in the first phase of VF, it should be defibrillated as soon as the defibrillator is charged, allowing for interruption of chest compressions as the cellular energy reserves of the heart makes successful defibrillation more likely. If the patient is suspected to be in the second phase or beyond, a full cycle of chest compressions should be performed before defibrillation to allow for replenishing of some cellular energy to improve chances of success.5 Electrical defibrillation is also warranted when the patient is experiencing pulseless ventricular tachycardia. VF and pulseless ventricular tachycardia are referred to as “shockable rhythms” based on their responsiveness to defibrillation. When a shockable rhythm is identified during assessment between compression cycles, chest compression should be resumed and a full 2-minute cycle completed as the defibrillator is allowed to charge. Defibrillation should be performed after the completion of the compression cycle. Monitoring during CPR can be best accomplished through the use of capnography and electrocardiography (ECG). FIGURE 9. The screen of a multiparameter ECG monitor during CPR. The ECG is registering mechanical action exerted by the compressions (blue circle). 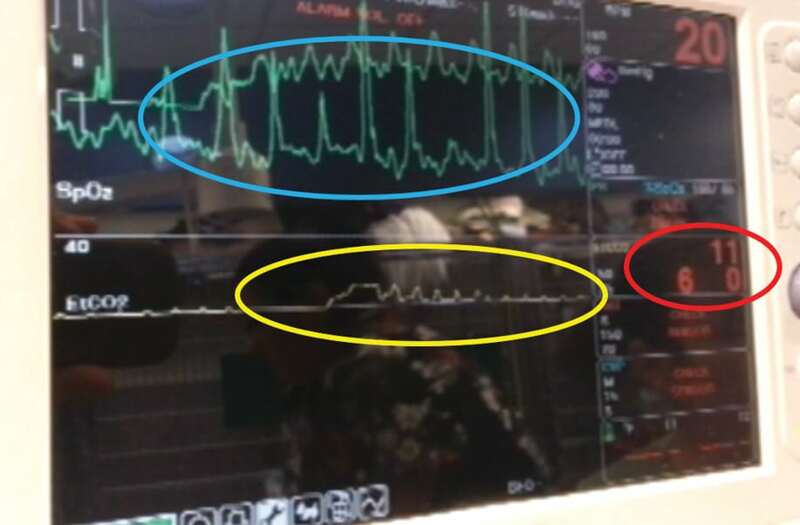 The capnography (yellow circle) is displaying a breath (larger plateau) and compression-induced ventilation (small spikes). The ETCO2 measurement (red circle) is reading 6 mm Hg and 11 breaths/min. Monitoring end-tidal carbon dioxide (ETCO2) values during CPR is the most useful method to assess the effectiveness of compressions in creating blood flow and lung perfusion. Because minute ventilation is relatively consistent during CPR, the measured ETCO2 value will increase in proportion to the pulmonary blood flow created through compressions (FIGURE 9). In addition, measurement of ETCO2 can be used to confirm that the endotracheal tube is in the trachea because significant CO2 is unlikely to be measured from the esophagus. However, a lack of measurement does not necessarily indicate esophageal placement, as ineffective compressions and poor pulmonary circulation will not produce CO2. During CPR, maintenance of ETCO2 above 10 to 15 mm Hg is favorable for the patient in achieving ROSC, whereas chances of ROSC were observed to be lower below these values.5 Capnography can also serve as an indicator for ROSC because the values will increase significantly, likely to hypercapnic values, upon re-establishment of pulmonary circulation from spontaneous cardiac output. ECG, which assesses the electrical activity of the heart, is a valuable monitoring modality during CPR. Between compression cycles, ECG can be monitored to determine spontaneous electrical activity (FIGURE 10). During the compression cycle, mechanical action will be detected, and it is difficult to distinguish between mechanical and spontaneous activity (FIGURE 9). Asystole is the most common arrest rhythm, in which case compressions should be resumed. The patient may exhibit electrical activity without any palpable pulse, or pulseless electrical activity (PEA), in which case compressions should be resumed. The possibility of PEA also highlights the importance of confirming actual pulses after visualizing electrical activity on ECG. Ventricular fibrillation (VF) is less common and is treated through defibrillation if present. Multiple members of the CPR team should be observing the ECG readout during the assessment period between compression cycles to clearly communicate the rhythm and swiftly move to the next step. For patients that recover from CPA and achieve ROSC, post–cardiac arrest care includes respiratory status optimization, cardiovascular system support and optimization, and neuroprotective therapy. An algorithm for postarrest care is provided in the RECOVER guidelines. Care for a patient after achieving ROSC is an intensive process, with ROSC being only the first hurdle to overcome toward actual survival to discharge; a patient that has arrested once is likely to re-arrest during this period. The presence of a CPR team leader significantly improves the flow during CPR. The leader is responsible for assigning roles to team members (TABLE 2), enforcing protocol, and facilitating communication. Intermittently summarizing the current status of the CPR attempt, soliciting input from team members, and organizing changes in roles and next steps are all important tasks performed by the CPR leader. Specific training for those taking on the role of a CPR leader is recommended. FIGURE 11. A structured CPR team. Separate roles between CPR leader (pink scrubs) and veterinarians (brown scrubs and red scrubs) allow for uninterrupted CPR while the case is discussed. At my place of employment, the role of CPR team leader, usually a veterinary technician, is intentionally assigned to someone other than the attending veterinarian to allow the CPR team and veterinarian to function independently. The CPR leader focuses on organizing the CPR, assigning roles, and directing the CPR flow. The veterinarian makes medical decisions, fills no other roles, focuses on patient diagnosis and treatment, and communicates with the client. 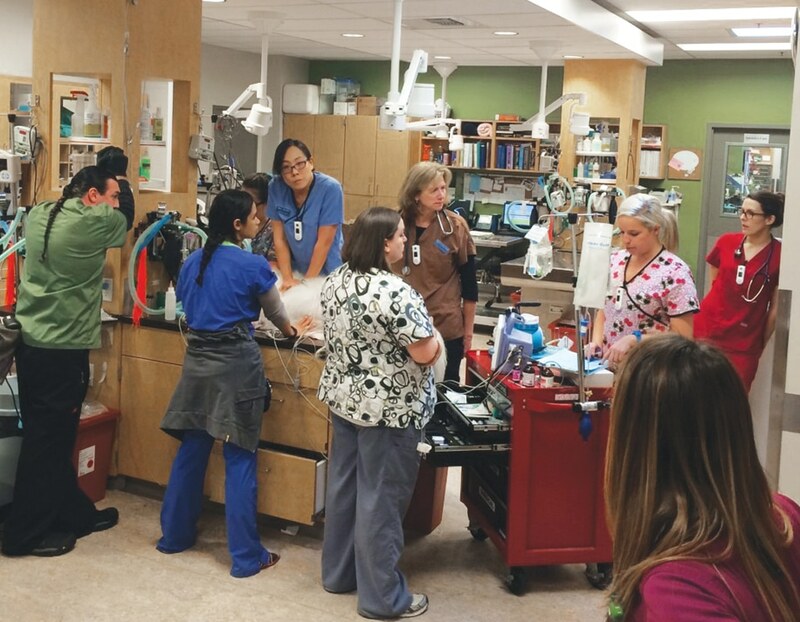 This veterinarian and CPR team arrangement has greatly enhanced our ability to manage the controllable factors of CPR and prevent delays and mistakes from splitting the veterinarian’s attention between the patient, client, and CPR flow (FIGURE 11). During CPR, the closed-loop communication method is recommended. This consists of instructions being given clearly and directed at one individual, who then repeats the instruction to confirm accurate communication. Closed-loop communication reduces the chances of medical errors due to misunderstanding or missing instructions and helps orient other team members about the status of CPR flow. FIGURE 12. 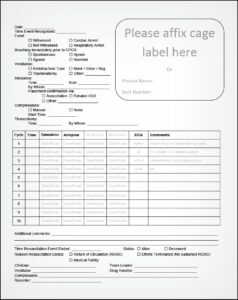 Sample CPR record form. A well-designed sheet to record pertinent details related to the CPR attempt is recommended (FIGURE 12). 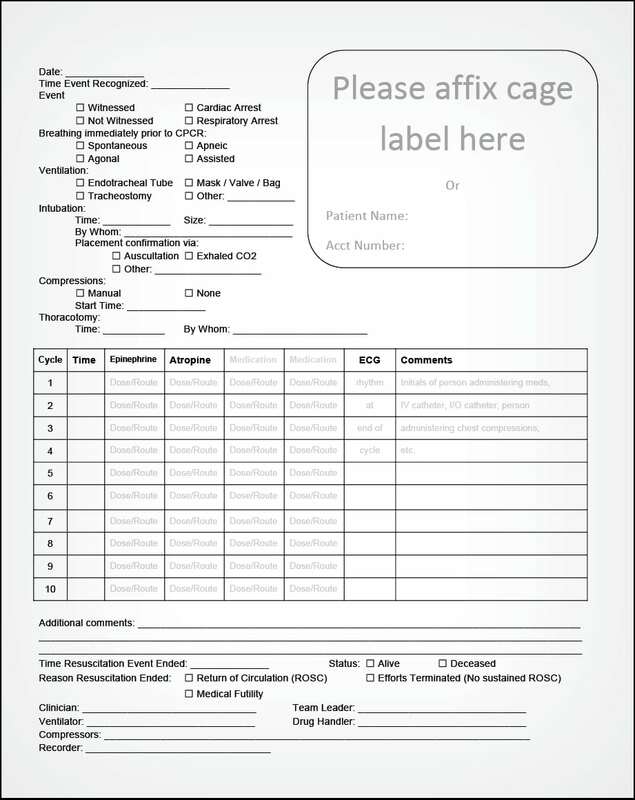 A standard record sheet serves as a checklist for tasks and roles required during CPR, provides documentation of specific events (eg, timing of last drug administration) during CPR, and enables review after CPR. FIGURE 13. A debriefing session enhances the team dynamics and facilitates further improvement of CPR through open and transparent communication. After a CPR event, a debriefing session is recommended to review and critique the performance from both an individual and team perspective. Debriefing sessions allow errors to be identified and provide an opportunity to develop plans for improvement by correcting any issues. The session is designed to let team members discuss the decisions made, actions taken, and possible alternatives; identify any need for training; and recognize each other for successful actions.9 Adequate debriefing can be conducted in 5 to 10 minutes by the team leader. Questions should include “What went well with this CPR session?”, “What could have been done better?”, and “Are there any major issues to report to the CPR committee?” Open and transparent discussion in a safe environment is vital to effective debriefing, which leads to both individual and team improvement6 (FIGURE 13). 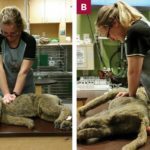 The RECOVER guidelines establish a standard and benchmark against which veterinary professionals can evaluate their CPR methods and training. 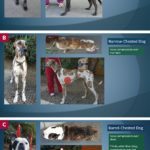 The need for standardized guidelines regarding veterinary CPR is well recognized internationally, and to date, the RECOVER guidelines have been translated into Portuguese, Spanish, Japanese, and Mandarin. All of RECOVER’s information will be housed on a central Internet resource to be available worldwide (recover-initiative.org). The RECOVER initiative is being updated, with publication planned in 2018. The 2012 RECOVER review process revealed knowledge gaps that are intended to be filled through ongoing research in the field, with the RECOVER initiative directly contributing. The establishment of the global registry and a standardized record sheet will allow each practice to contribute to the data collection, and additional methods are planned. 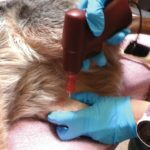 Through the process, the RECOVER initiative has pioneered a large-scale evidence-based guideline creation process that is translatable to a variety of topics in veterinary medicine. Both online and physical CPR certification courses have been created and approved by the American College of Veterinary Emergency Critical Care and the Veterinary Emergency and Critical Care Society. Certification for the psychomotor training is being expanded through the establishment of an official trainer network to significantly increase global accessibility. For veterinary professionals, preparedness for CPA through certificate training should be considered a standard in practice. The training is reaching other animal workers and the lay public to improve chances of resuscitation for out-of-hospital arrests as well. Veterinary technicians play a critical role in assessing patients at risk of experiencing CPA and swiftly initiating CPR when necesssary. While the current success rate and the rate of survival to discharge are expectedly low, establishment of organized training based on an evidence-based protocol such as RECOVER is a duty of the veterinary team to ensure the best possible chance of a positive outcome. The author would like to thank Dr. Manuel Boller and Dr. Dan Fletcher for providing the latest information on the plans of the RECOVER Initiative. Ellis S. Man uses CPR, saves dog’s life. Global Animal [website]. March 29, 2011. globalanimal.org/2011/03/29/man-uses-cpr-saves-dogs-life-video. Accessed March 2017. Hofmeister EH, Brainard BM, Egger CM, et al. Prognostic indicators for dogs and cats with cardiopulmonary arrest treated by cardiopulmonary cerebral resuscitation at a university teaching hospital. JAVMA 2009;235(1):50-57. McMichael M, Herring J, Fletcher DJ, et al. RECOVER evidence and knowledge gap analysis on veterinary CPR. Part 2: Preparedness and prevention. J Vet Emerg Crit Care 2012;22(S1):S13-S25. Hopper K, Epstein SE, Fletcher DJ, et al. RECOVER evidence and knowledge gap analysis on veterinary CPR. Part 3: Basic life support. J Vet Emerg Crit Care 2012;22(S1):S26-S43. Fletcher DJ, Boller M. Cardiopulmonary resuscitation. In: Silverstein D, Hopper K (eds). Small Animal Critical Care Medicine. 2nd ed. St Louis: Elsevier; 2015. Fletcher DJ, Boller M, Brainard BM, et al. RECOVER evidence and knowledge gap analysis on veterinary CPR. Part 7: Clinical guidelines. J Vet Emerg Crit Care. 2012;22(S1):S102-S131. Rozanski EA, Rush JE, Buckley GJ, et al. RECOVER evidence and knowledge gap analysis on veterinary CPR. Part 4: Advanced life support. J Vet Emerg Crit Care 2012;22(S1):S44-S64. Boller M, Fletcher DJ, Brainard BM, et al. Utstein-style guidelines on uniform reporting of in-hospital cardiopulmonary resuscitation in dogs and cats. A RECOVER statement. J Vet Emerg Crit Care 2016;26(1):11-34. Salas E, Klein C, King H, et al. Debriefing medical teams: 12 evidence-based best practices and tips. Jt Comm J Qual Patient Saf 2008;34(9):518-527. Which of the following best describes the RECOVER initiative? An initiative for creation of evidence-based guidelines through review of current evidence and identification of knowledge gaps. An initiative aimed at optimizing recovery from psychologic strains of participating in CPR. An initiative with the goal of producing evidence of CPR success rates through thorough review of electronic records globally. An initiative with the goal of producing a white paper on CPR to be used as a reference. Which of the following are key components of basic life support? Which of the following patients is likely to have the best chance of successful CPR outcome? 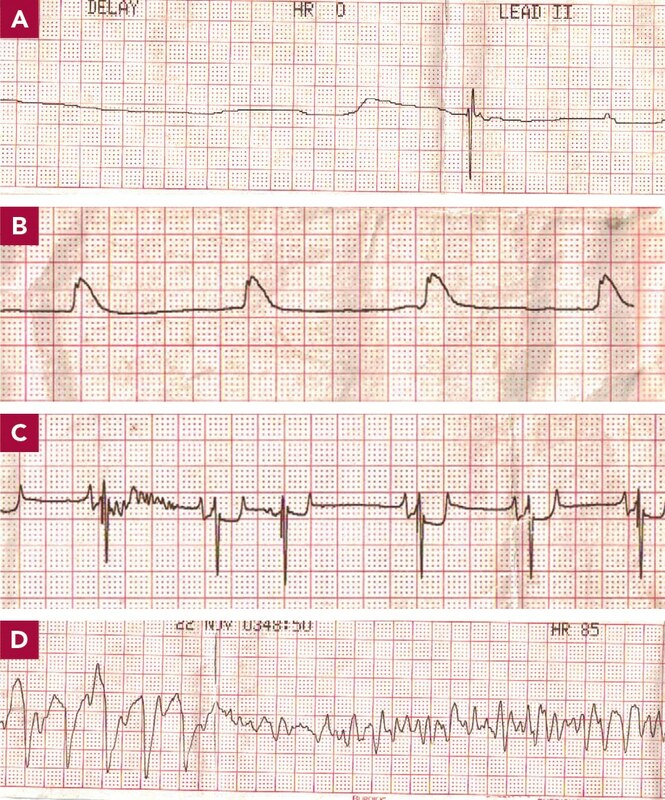 Which of the following is a characteristic of chest compression as recommended by RECOVER? Which of the following is an accurate statement regarding interruptions of compressions during CPR? There is no harm in interrupting compressions to assess the patient. Interruptions significantly reduce myocardial perfusion pressure and should be prohibited. If interrupted, maximal circulation is re-established after 15 seconds of compressions. Two minutes of uninterrupted compressions produce approximately 80% of spontaneous cardiac output. Where should compressions be focused for round-chested patients? Which of the following are accurate characteristics of ventilation delivery during CPR? Which of the following monitoring methods is the best measure of effective chest compressions during CPR? Which of the following drugs provides its benefit during CPR by redirecting blood flow to the body core? Which of the following are benefits of regularly conducted debriefing sessions after the conclusion of CPR?